Mike Dudek is one of the good guys. He is always quick to lend an ear, give some feedback, or tease me about ANOTHER r0tring deal he got. Did you know he makes killer products too? His pen and notebook holders are works of art and he is offering one up for giveaway to the readers of The Pen Addict. 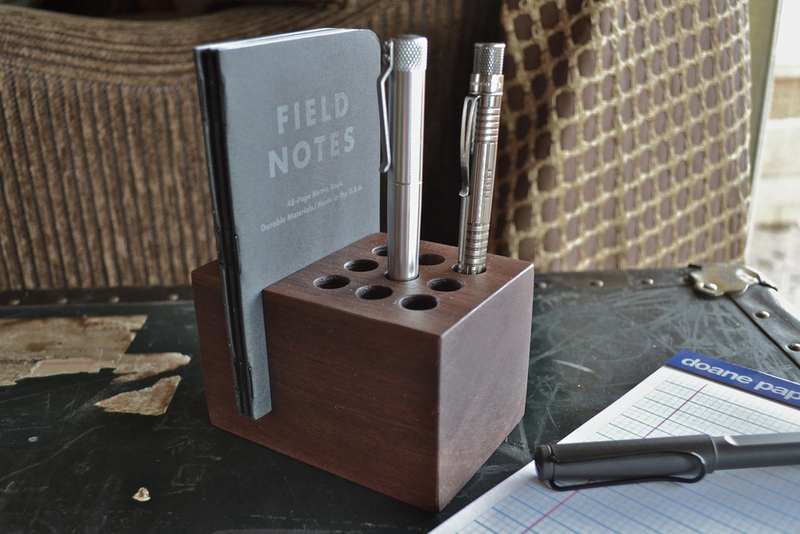 Handmade from solid walnut and finished in a soft, satin poly, this piece combines a place to hold 9 of your writing instruments up to 1/2 inch in diameter and a space to store/display three of your favorite pocket notebooks all in one tidy place. Leave one comment on this post anytime between now and Thursday night at 11:59 PM Eastern Time. You are limited to one entry. This contest is open to US and International readers. The contest winner will be posted on Friday, February 28th. The winner will have one week to email me via the Contact link at the top of the page. Thanks to Mike Dudek for offering up this great item and be sure to check out his shop for more great designs! Posted on February 25, 2014 by Brad Dowdy and filed under Giveaways.